Shaun Keaveny and Cerys Matthews get comfy around the campfire, speaking to the Master Musicians Of Joujouka, comedian Phil Nichol and poet Tony Walsh. 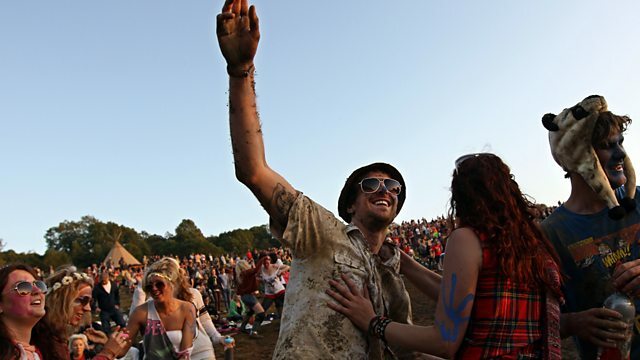 Join Shaun Keaveny and Cerys Matthews as they get comfy around the campfire to look back over the days events at Glastonbury 2011, with live music from this years stellar line up, poetry and a closer look at the weird and wonderful acts that make the Glastonbury experience an unforgettable one. They will be joined by a Sufi trance group; Master Musicians of Joujouka hailing from the village of Jajouka near Ksar-el-Kebir in the Ahl Srif mountain range of the southern Rif Mountains in Morocco. The Master Musicians were first recorded by Brian Jones of The Rolling Stones, collaborated with Ornette Coleman and most recently, Jane's Addiction. They adhere to the traditional Sufi trance music of their patron saint passed down for 1200 years and were employed by the Kingdom of Morocco as the royal musicians of the sultans. Plus Phil Nichol joins Shaun and Cerys to talk comedy at the festival...well he is an award winning comedian doing a show in the Cabaret Tent! AND, this years poet in residence; Tony Walsh delivers a poem written just for you! Another must listen moment from Glastonbury here on BBC 6 Music.